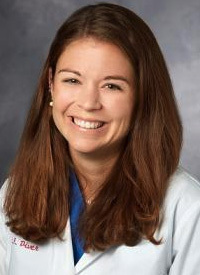 PARP inhibitors have made a significant impact on the field of ovarian cancer, especially in patients with germline BRCA mutations, explained Elisabeth Diver, MD. Their influence is poised to grow in combination with other drugs, she said, such as checkpoint inhibitors and antiangiogenic agents. In November 2018, the FDA granted a priority review designation to a supplemental new drug application for olaparib (Lynparza), which was based on data from the phase III SOLO-1 trial. The application was submitted for use as a maintenance therapy in patients with newly diagnosed BRCA-positive advanced ovarian cancer who achieved a complete or partial response to standard frontline platinum-based chemotherapy. At 41 months of follow-up, the median progression-free survival (PFS) by independent central review had not yet been reached in patients who received frontline maintenance with olaparib versus 14.1 months in those who received placebo. The median PFS in the investigator-assessed PFS was not reached in the olaparib arm versus 13.8 months in the placebo arm (HR, 0.30; 95% CI, 0.23-0.41; P <.0001). The FDA is scheduled to make its decision on the application by the end of the first quarter of 2019. In an interview during the 2018 OncLive® State of the Science Summit™ on Ovarian Cancer and Soft Tissue Sarcoma, Diver, a clinical assistant professor of obstetrics and gynecology, gynecologic oncology at Stanford Medicine, discussed ongoing advances with PARP inhibitors in ovarian cancer. Diver: I discussed the role of PARP inhibitors in ovarian cancer by focusing on the 3 FDA approved PARP inhibitors: olaparib, rucaparib (Rubraca), and niraparib (Zejula). I spoke about their various FDA-approved and non-FDA approved indications for the treatment of women with ovarian cancer. Could you elaborate on the data we have seen with each PARP inhibitor? For niraparib, we spoke about the FDA-approved indication for women with platinum-sensitive ovarian cancer as maintenance therapy after platinum-containing chemotherapy. The approval was based on the NOVA trial. This trial was important for ovarian cancer management as it showed benefit in all women with ovarian cancer, regardless of BRCA germline or somatic status. For olaparib, the most exciting update we have is the new data that just came out with the SOLO-1 trial. We reviewed the new findings, which demonstrated a dramatic PFS benefit after upfront chemotherapy for women with germline BRCA mutations. For rucaparib, we reviewed the ARIEL2 and ARIEL3 trials to discuss the maintenance and treatment indications. Could you highlight the data from the phase III SOLO-1 trial? At the 2018 ESMO Congress, we saw the first PFS curves come from SOLO-1. In this trial, we showed that the median PFS for women with germline BRCA 1/2 after upfront treatment with olaparib was not yet reached. Sixty percent of patients were disease-free at 3 years. What was the impact of the QUADRA trial? QUADRA shows us that we can potentially use PARP inhibitors for treatment in all-comers regardless of BRCA status, though outcomes were certainly better in women with BRCA mutations than those without them. What are some ongoing trials in the space that you’re excited about? From here, we're excited to see the results of some of the other ongoing PARP inhibitors trials, including GOG-3005 with veliparib. Additionally, [we are waiting to see] some of the upfront niraparib data that we anticipate coming out soon. What novel therapies are coming down the pike? We spoke a little bit about some of the combination therapy data with PARP inhibitors. None of these combinations are FDA approved, but we looked at the data with cediranib and olaparib from Joyce F. Liu, MD, MPH, in platinum-sensitive ovarian cancer as well as some of the new TOPACIO data.